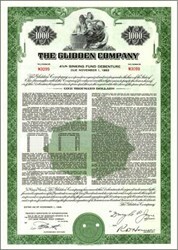 Beautifully engraved certificate from the Glidden Company issued in 1958. 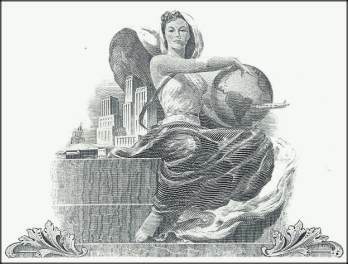 This historic document was printed by the Security-Columbian Banknote Company and has an ornate border around it with a vignette of an allegorical woman holding a globe with a city skyline in the background. This item has the printed signatures of the Company�s President and Secretary and is over 43 years old. Glidden has been known in the paint and coatings industry for more than a century. It was in the year 1875 that 42-year-old Francis Glidden started a varnish-making business with two other partners along the Cuyahoga River in Ohio. The name of their company changed from Glidden, Brackett & Co. and became the Glidden Varnish Company in 1894. The company employed only 18 workers and produced more than 1,000 gallons a week of a variety of industrial finishes for furniture, pianos, wagons and carriages. During 1895 the company decided to move into the consumer market with a product named Jup-A-Lac� as a colored varnish coating that became a household name accross America. In 1917 Mr. Glidden sold his company to Adrian D. Joyce and his associates and it was incorporated as The Glidden Company. Mr. Joyce decided to strengthen his newly formed national company with eleven acquisitions in less than two years. As the company prospered with sales growth throughout the U.S., it became one of the largest coatings manufacturers and one of the first United States conglomerates. E.R. Durkee & Company, known as a maker of Durkee Famous Sauce, was sold in 1929 to The Glidden Company which then began to market edible oils and food service products using the Durkee� name. In 1967 The Glidden Company merged with SCM Corporation (Smith-Corona typewriters and Marchant calculators) and became its largest division. During 1986, Glidden ownership passed from SCM through Hanson Trust PLC to ICI(Imperial Chemical Industries PLC), creating the world's leading paint manufacturer-ICI Paints. Today, ICI Paints is the second leading manufacturer of decorative paints and coatings in the United States. It has established North American headquarters in Cleveland, Ohio, and employs 7,000 people and has 19 manufacturing sites in the U.S., Canada and Puerto Rico. ICI has 660 company-owned paint stores for professional painters and contractors in Canada, Puerto Rico and the United States. It uses universal tinting systems which contain the largest color selection in the industry and is a leader in a complete no-VOC waterborne paint line with full color capability. Along with the Glidden� brand, ICI owns Devoe, Ameritone, Sinclair, Fuller-O'Brien, Decratrend, Dulux, St. Clair and Superior, Reliance and Banner company brands. The North American decorative trademark names include Lifemaster, Spred, Endurance, Ultra and Ultra-Hide.